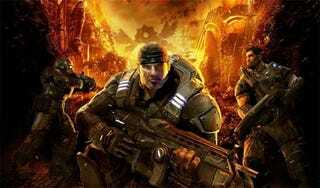 We've come into possession of a draft screenplay for the Gears of War movie. If you'd like to remain spoiler-free, move right along. If, however, you'd like to see what we think of it, read on! While the movie will be based on a script by Chris Morgan, it appears that Stuart Beattie - who worked on the Pirates films, as well as the in-limbo Halo flick - penned a draft as well. How&apos;s That Gears Of War Movie Coming Along? The draft is an entertaining romp, part homage to the game, part homage to high-fiving, badass 80's action movies. If you were worried a Gears movie wouldn't be true to the games, or the spirit of the games, you can stop worrying about the writer. Sure, directors, actors and producers may mess with things along the way, but going by this draft, Beattie's heart seems to be in the right place. There's not much chit-chat. Don't expect long-winded conversations about the savagery of war, observations of the frailty of human society or concerns over the destruction of a planet; the Gears movie (so far, at least) is a place for stupid one-liners and ultra-violence. There are scenes where Marcus and Dom eviscerate entire squads with their chainsaws. Marcus' first Locust kill is via a vicious curb-stomp. He also manages to blow four Locust's heads off in succession with a longshot, we witness extreme acts of torture and bloodshed on an epic scale, as a Locust horde mows down a crowd of women and children. The story serves as a prequel to the events of the first game. I'm not up to speed on the expanded fiction of Gears, so have no idea how closely this matches with the books and comics, but the film begins with a massive fight sequence, which depicts the final battle of the Pendulum Wars. Following this, the victorious COGs return home, and we're left with some non-fighting scenes (there aren't many) between Dom & Maria, their kids, "Uncle Marcus", Marcus' estranged father Adam, and some booze. Soon enough, though, the Locusts emerge, and having killed Dom's kids set about killing everybody else. Marcus, Dom & Maria manage to escape and regroup with the rest of the survivors, and we're then treated to another massive fight sequence, as the COGs take the fight back to the Locust. This goes pear-shaped, though, and soon everybody has to fall back to Jacinto, the last remaining human stronghold, as Adam Fenix unleashes the Hammer of Dawn upon not only the advancing Locust, but any humans unable to make it into the city in time. It works, to a fashion, but needs to be shrunk down and made portable to be effective. So Adam, Marcus & Dom lead a team of COGs down underground, into "The Hollow" (the Locust's turf), to capture some crystals that Adam needs to create a handheld Hammer of Dawn. ...just in time for the final Locust assault on Jacinto. Think Minis Tirith in Return of the King. A walled city, ringed by defenders, battling furiously against a horde of attacking monsters. Meanwhile, Adam Fenix is dragged topside by Lt. Thawn, and taken to his mansion, where he must retrieve the prototype Hammer of Dawn and give it to the Locust. Adam contacts Marcus, who abandons his post at the massive city battle (which isn't going well for humanity) to go save his father. When he arrives, he fights first a Reaper, then Lt. Thawn. Just as Thawn is about to kill Marcus, Adam gets the portable Hammer of Dawn working, and blasts him with it. Thawn somehow survives this, and kills Adam, but weakened by the blast Marcus sticks him in the head with a torque bow arrow and his head just explodes. With the portable Hammer of Dawn now working, the humans are able to drive the Locust back, and save the city. Cue the celebrations. For his part in abandoning his post, however, Marcus is sentenced to 40 years prison. Then, after the credits, you get a treat for sticking around: a word-for-word, scene-for-scene recreation of the intro to Gears 1, as Dom busts Marcus out of prison. Look, this is a draft of the screenplay they didn't make the cut. Who knows what the actual screenplay will look like. But going by just this screenplay, it looks like a blast, as it's doing everything people enjoy about Gears - over-the-top war buddy antics, throwaway one-liners and copious amounts of red stuff - while doing little to mess with that simple formula. - Maria goes missing at the end, setting us up for her and Dom's "reunion"
- Adam Fenix first discovers the Locust when he sends six robots down into "The Hollow". These are all named after Gears developers: Mike, Rod, Anne, Kim, Lee & Cliff. - Cole and Baird feature, but only shortly at the beginning, and only as COGs for the final fight sequence at Jacinto. - The screenplay is full of hat-tips to the games. Example: in the opening battle, Marcus roadie-runs for the camera, as well as using a meat shield.